Our Slack community is available exclusively to subscribers. The community is a place where you can collaborate on projects with Dataquest students, get help from fellow learners, discuss career questions or any other Data science-related topics. Once you subscribe you'll get an invitation to the community, and you'll be able to login using the email address associated with your Dataquest account. If you're running into trouble logging in - try to reset your Slack password by using the email address associated to your Dataquest account. If that doesn't help you can reach out to us by clicking the ? icon — our Support team would be more than happy to get you set up correctly. We've found that students who engage with our community are much more successful at reaching their goals, so we highly recommend taking advantage of this feature. The more active you are, the more opportunities you'll have to explain/be explained to. What follows is a condensed version of the Slack Community Guidelines, which you can read in full detail, here. ✅ Use threaded messages, when possible, to keep the channels clean. ✅ Share your knowledge — the most effective types of learning come from explaining concepts, and in return, being explained to. ✅ Use proper formatting to keep your code readable — it makes it much easier for other students to help! ✅ Post your questions in their relevant channel — e.g. a Python question should be posted in #python. ✅ Email us at hello@dataquest.io or use the in-app messaging system (by clicking the ? in the application header) to report bugs, give feedback, and ask our team specific questions about missions. This Slack was designed for peer to peer interaction, not as a direct support channel, so emailing us directly is the best way to get timely support. ✅ Resist the temptation to DM or @tag moderators and DQ staff — sending your questions through email (to hello@dataquest.io) or via the in-app messaging system (via the ? header button) allows us to better manage responses across our team to make sure you get a timely response. 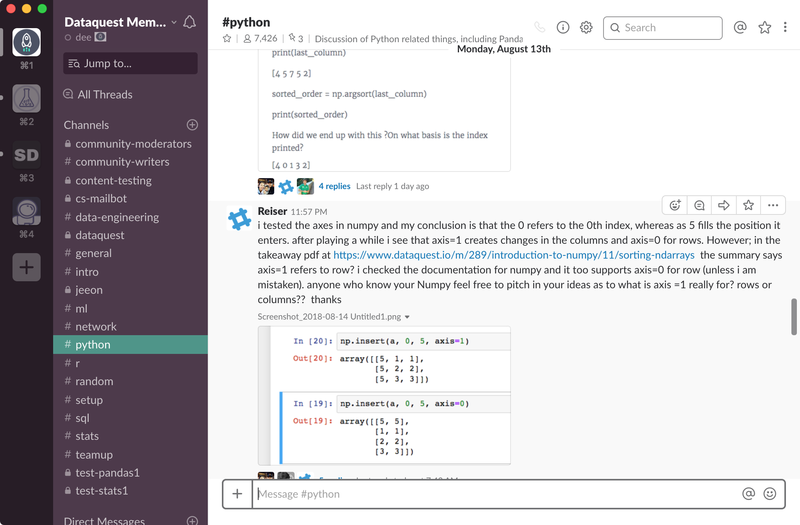 Messages are easily lost in Slack, and we don't want your question/feedback to slip through the cracks! 🚫 Post the same question in multiple channels. 🚫 Use the Slack channel for personal advertisement.